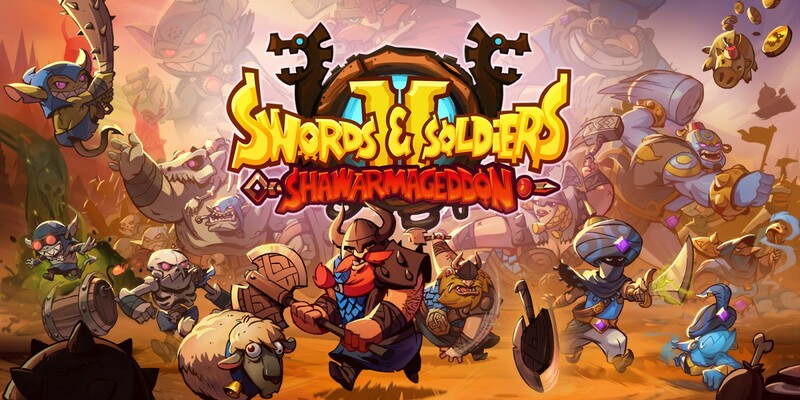 The second iteration of Swords & Soldiers gains new life in the Shawarmageddon version on Nintendo Switch. Making a game isn’t as easy as it may sound, but making a sequel can be an even worse and big challenge. What do you change from the original to make a better sequel? What do you add to make this continuation stand out from the prequel? How do you make it all come together without breaking the gameplay? These questions and a lot more, certainly went through the mind of the developers over at Ronimo Games as they were creating a sequel to their successful game, Swords & Soldiers. Swords & Soldiers II was first unveiled in 2014 and released in 2015, as a Nintendo Wii U exclusive. After over 2 years of exclusivity, Ronimo Games saw fit to make the game multiplatform and to add some improvements to it. After a cancelled Kickstarter campaign to fund the upgrade, the new version, Shawargeddon, finally released on various platforms and just recently made its way to the Nintendo Switch. How does this release stack up to the original? Are the upgrades enough to justify a sequel? Let me answer both those questions for you! Visually speaking, Swords and Soldiers II still opts for a 2D design rather than going three dimensional and that really doesn’t hurt the game in any way. The troops of each of the 3 armies are amazingly designed to suit the concept of each race, while also standing out from the backgrounds and being uniquely different for each unit. The backgrounds and other elements also neatly reflect this quality design, being each arena beautifully represented. I can say that I prefer the visuals in this game than in the predecessor. The animation is also formidably done, giving life to each unit attacks and movement, while also setting each unit even more apart from the others. They s are also applied to many of the background objects, such as a sleeping drunk guy and moving outdoors, bringing even more life and reality to each of the arenas, solving some of my problems with the original’s background, which sometimes felt dull. The musical experience in Sword & Soldiers II is also an excellent upgrade from the duller and not memorable songs in the first one. They fit amazing well with the atmosphere, while also going along well with the actions and sound effects. While in the first game I ended up turning off the music, in this one, I never felt the wish to do that and I kept playing while experiencing all the tracks the game has to offer. I also like the balance that they gave to the sound effects, avoiding a big noise mess. but also giving quality effects to each, reinforcing the units uniqueness. Swords & Soldiers II, like the first one, supports the use of traditional controllers and also takes advantage of Nintendo Switch’s multi touch-screen, but here is where one of the few step-backs happened. While in the original, you could change freely between both modes, allowing for an easy playthrough in the style that you want and even for a mix of both, in the sequel, this change has to be toggled by pressing a button in the corner of the screen. It isn’t a too big a deal, especially since moving the camera can still be done with analog input while in touch-screen mode, but is a step back that, in my opinion, didn’t need to happen. Gameplay-wise, this sequel refines the adaptations they did to this game style and that was introduced in the first game, while also introducing elements, such as a hero class and new spells, to help give the matches plenty of variety and spice them up even more. You still control which units are created, which spells are used and where and what path in bifurcations your army will take, while the units automatically collect resources or march to the enemy’s base and attack enemies they find on the way. The upgrade map is also available in the sequel and it is still essential, because making a wrong upgrade can even cost your game. However, Ronimo Games not only refined what was already available, but also introduced some new elements to make the gaming experience more interesting, while also matching them with the new armies. New units, spells and special attacks were introduced to each group, while also introducing Heroes, a special class that is more difficult to summon, but can help you turn the tide of a game. When you boot up the game, you will be introduced to 3 different categories, some of them with subcategories. These categories are the Campaign, Online and Custom modes. The campaign is where you can play the story behind the conflict involving these factions. This mode is a giant step up from the original one as it features a more interesting story, that evolves before and during each mission and is normally introduced with voiceover work. Beyond that, it offers an always evolving map with main and side battles to keep the story going while giving the player some different challenges. Each battle also has 2 additional challenges to be completed, giving the player one more reason to play through them more than once. Custom mode is the area where the other offline experiences are available. You can do a match against a CPU using the setup that you prefer, you can do a duel with a friend, each using a joy-con or touch controls and half of the screen, and also replay the 2 challenges available to play in the campaign. This area ends up being perfect for honing your skills or simply having fun alone with the challenges and a standalone match or having some heated battles when you have a friend around. Finally, Swords & Soldiers II: Shawargeddon fixes one of my big problems with the original by introducing online features, not only with Online Matches, but through leaderboards in challenges too. However, the online matches are where the online introduction really makes the difference. In it, you are able to play with strangers through the Quickmatch service or you can invite your friends with access to the game to matches even when apart, allowing this game to have infinite replayability and completing the neat package that Ronimo Games set out to create. Swords & Soldiers II: Shawargeddon is a big step up that expands and evolves everything they did in the first game and even in the original version of the second. There is a lot in this game for those who liked the first and even more, for those who like Real-Time Strategy games (RTS games) and haven’t played the original game, so I totally encourage you to give it a try.